Place your first order online and get 10% off! 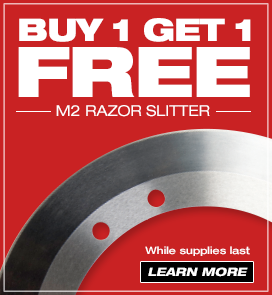 Saving on your industrial knife order couldn’t be easier. Simply create a new online account and you will receive a 10% discount on your first online order. No promotional code needed. The discount will be automatically applied at checkout. One promotional discount per location. We have expanded and extended our granulator knife sale. Save up to 60%. We are offering our BEST PRICING of the year for select models. Check back often for new promotions! The 10% first order discount is for new web customers only. Existing customers may qualify for first order online discount. To qualify for the discount, orders must be placed online. This offer cannot be used in conjunction with any other discount or promotional offer. Prices subject to change without notice.